In a post last week, I pointed out that there was a highly unusual inverse correlation between the 5- and 10-year real interest rates as approximately reflected in constant maturity 5- and 10-year TIPS. (On the meaning of the term “constant maturity” see the very valuable and informative post in J.P. Koning’s excellent blog summarizing discussions in the many blogs that he follows and comments on) about the various blogs Since early May the correlation coefficient between the yields on constant maturity 5- and 10-year TIPS was about -.72 (as of today it’s -.77), while the correlation coefficient between the two yields since the start of 2012 was .86. It occurred to me after writing the post (I added an update to make the point) that one reason for the inverse correlation might be an increased in the expected likelihood of a financial crisis, in which case real short-term interest rates would rise during the crisis as people expecting to be short of cash bid up real rates trying to get their hands on cash ahead of the crisis, while also selling off assets (either fixed capital or inventories). This week, I was able to do a little further work, looking at data since 2003, on the correlation between interest rates at the 5- and 10-year time horizons. 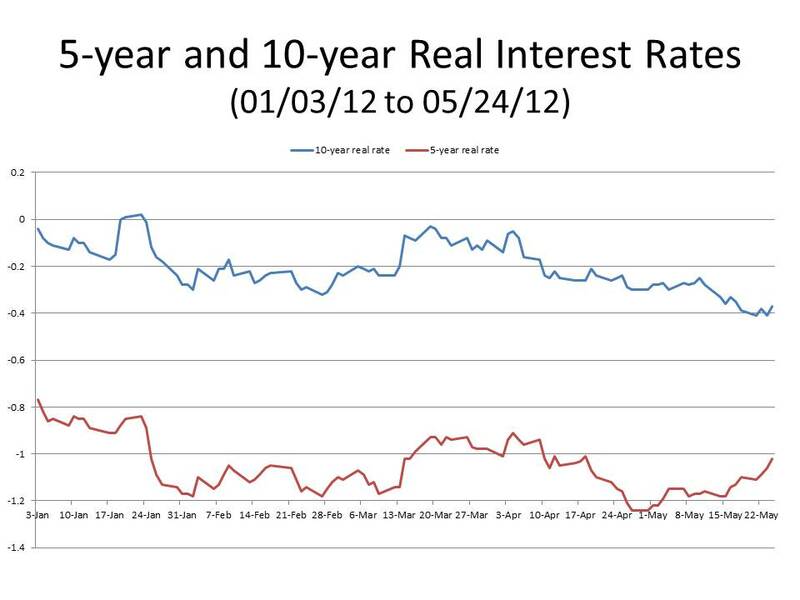 Since 2003, the correlation between real 5- and 10-year interest rates is about .96. I computed monthly correlations, which are usually over .8 and regularly over .9. Only very rarely was there a (barely) negative monthly correlation, certainly nothing close to the -.77 correlation during the first 30 days of this month. 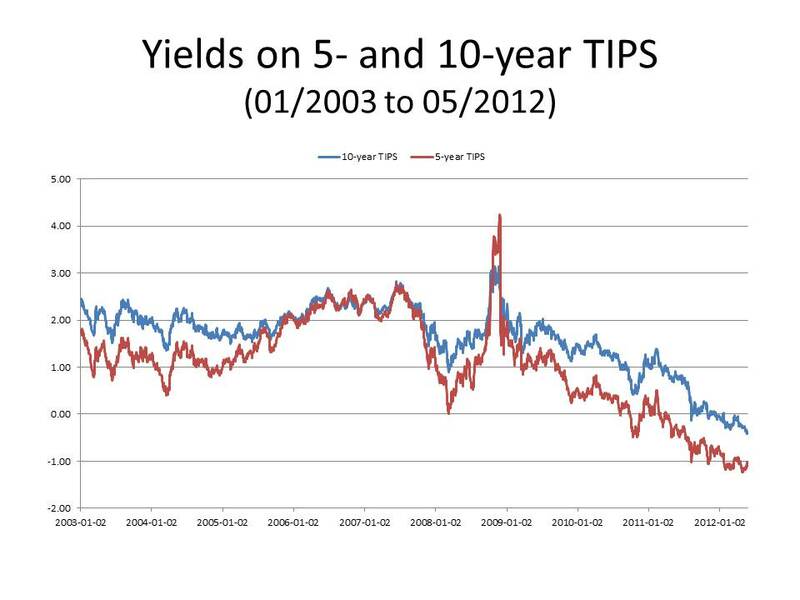 However, as I computed the correlations, I found that a more meaningful measure of the relationship between the 5- and 10-year yields on TIPS is the absolute difference between them. The graph below plots the yields on 5- and 10-year constant maturity TIPS since 2003. The most striking period is clearly in October and November of 2008, when the yield on 5-year TIPS soared above the yield on 10-year TIPS, because of the desperate scramble for liquidity at the height of the financial crisis. A few other periods of financial stress, associated I think with the first signs of the bursting of the housing bubble, were also associated with yields on the 5-year TIPS slightly exceeding the yield on the 10-year TIPS. A second graph displaying the difference between the yields on the 10-year and the 5-year TIPS is also useful, clearly showing the effect of the spike in short-term real interest rates at the height of the financial crisis. In this context what is striking about the recent anomaly in the real term structure of interest rates is the steepness with which the difference between the yields on the 10- and the 5-year TIPS has been falling. The drop seems steeper than any but the one that started around October 6, 2008, three weeks after the failure of Lehman Brothers, but the day on which the Fed announced that it would begin paying interest on reserves. By the end of October, the difference between the yields on the 10-year and 5-year TIPS had fallen by over a percentage point. Since May 3, the difference between the yields on the 10-year and 5-year TIPS have fallen 37 basis points, so we are clearly not in a panic. But the signs are disturbing. Reading a review, not long ago, by John Lanchester of Michael Lewis’s book Boomerang: Travels in the New Third World in the New York Review of Books, I was struck by the following quotation of an unnamed German official explaining why there was no credit boom in Germany. For a generation or two after World War II, the rest of the world was thankfully spared such expressions of insufferable German self-satisfaction. But as memories of the second World War gradually fade, and the victims of German megalomania are rapidly disappearing, it is apparently again acceptable in Germany to make statements as unbearably self-congratulatory as the horrendous quotation recorded above. And lest I be misunderstood, I am in no way suggesting that it is only Germans that are capable of the barbarities committed in World War II by the Nazi regime. “It can’t happen here” is a conceit too often refuted by bitter experience for anyone to feel very confident about his country’s (or his own) conduct in extreme situations. There would be no point in highlighting an absurd statement by a tone-deaf German official if the statement did not reflect the views of many Germans, and none more so than the German Chancellor, Mrs. Merkel, though she is surely far too adroit a politician ever to express such a view within earshot of a journalist. But clearly the smug conviction in the utter rectitude of Germany’s anti-inflation posture and of the German insistence that the burden of discharging the sovereign debts incurred by the debtor countries fall entirely on the individual countries, and not on the Eurozone as a whole (i.e., not on Germany), stems from the moral certainty that the debtor countries are asking to be forgiven for “behavior that is totally unacceptable in Germany.” What self-respecting German could possibly agree to absolve those countries from the consequences of actions that no German would ever dream of undertaking? That is the hubristic mindset that impels Mrs. Merkel and her countrymen to lead the European Union into the abyss. The whole point of the European Union was somehow to embed and contain Germany within the democratic framework of a larger union in which Germany might play an important, but never a dominant, role. For almost 60 years, the Federal Republic of Germany was in almost every way an admirable modern European state, playing a cooperative and constructive role in both European and world affairs. But especially after reunification, Germany has gradually assumed an increasingly preeminent role in Europe, and now the fate of Europe, and perhaps of the world, again lies in the hands of a German Chancellor, a leader perfectly attuned to the sentiments and intuitions of her people, and utterly oblivious to the consequences of what she is about to do. What we are witnessing is not a Greek tragedy, but a German one. But, I greatly fear that we shall all suffer the consequences of her misplaced confidence in the uprightness of her position and in her flawed understanding of Germany’s national self-interest. 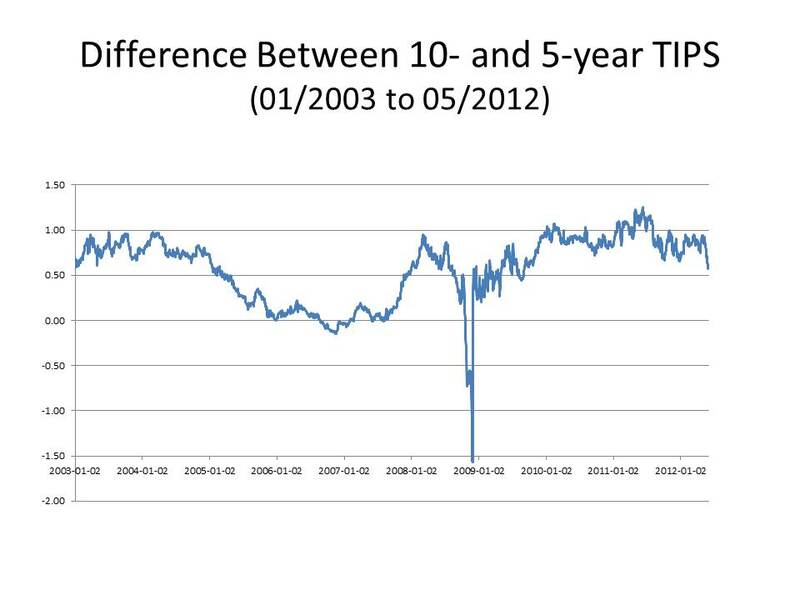 Regular readers of this blog know that I track the break-even TIPS spread to follow changes in inflation expectations. Doing so also provides an implicit (and imperfect) estimate of changes in the real interest rate. (For an explanation of why the break-even TIPS spread is an imperfect estimate of inflation expectations and the real interest rate, see the Cleveland Federal Reserve Bank website.) Since early in May, the data show a fairly striking anomaly in real interest rates: real interest rates over a 5-year time horizon have been rising (though still negative) while real interest rates over a 10-year horizon have been falling. Why is this anomalous? Because real interest rates at the 5-year and 10-year time horizons are generally closely correlated. The chart below shows fluctuations in real interest rates at constant 5- and 10-year maturities since the beginning of 2012. The two lines track each other closely until the beginning of May when the 5-year real interest rate begins to rise while the 10-year real interest rate continues to fall. The coefficient between the 5-year and 10-year real interest rates from January 3 to May 24 is slightly over .8. From January 3 to May 3, the correlation coefficient is almost .86; the correlation coefficient since May 3 is -.72. I have no explanation for this anomaly. Anybody out there like to take a crack at it? UPDATE: It just occurred to me that the increase in short term real rates is reflecting a liquidity premium associated with an increasing perceived likelihood of a financial crisis associated with a breakdown of the euro. Not a very happy thought as I prepare to call it a night. if you begin with welfare policies of any sort — directing individuals, taxing for social ends, engineering the outcomes of market relationships — you will end up with Hitler. Was Hayek a (Welfare) Statist? There’s been a little flurry in the blogosphere of late about what F. A. Hayek thought about the welfare state, apparently touched off by a remark made by the late Tony Judt in a newly published book, the result of a collaboration between the late Tony Judt and Timothy Snyder Thinking the Twentieth Century. Judt makes the following charge. Hayek is quite explicit on this count: if you begin with welfare policies of any sort — directing individuals, taxing for social ends, engineering the outcomes of market relationships — you will end up with Hitler. Tyler Cowen, in a generally favorable and admiring take on the book and Judt’s writings, observed that Judt was being unfair to Hayek. Then, Henry Farrell weighed in on Judt’s side and cited the discussion between Andrew Farrant and Edward McPhail who contend that Hayek wrongly held that any form of welfare statism would lead to totalitarianism while Caldwell denied that this was Hayek’s argument in The Road to Serfdom, maintaining that Hayek’s subsequent criticism of the welfare state was more subtle and less categorical than the argument of The Road to Serfdom against full scale planning. Farrell criticizes Cowen and Caldwell for defending Hayek, even while acknowledging a bit of sloppiness on Judt’s part in not making clear that Hayek did distinguish between the provision of some forms of social insurance from welfare-state policies. To support his case against Hayek, Farrell quotes from Hayek’s introduction to the 1956 American edition of The Road to Serfdom in which Hayek cited the experience of England under the post-war Labour government in warning that the statist policies of the Labour government would cause an adverse change in public attitudes that would eventually erode even the English pubic’s attachment to liberal principles. However, even if Hayek qualifies his claims in the first paragraph quoted, he’s changed his tune towards the end. He very explicitly claims that the paternalist welfare state is creating the conditions under which (unless the policy is changed or reversed) totalitarianism will blossom, reducing the populace (as described in the bit of Tocqueville that Hayek quotes) into a “flock of timid and industrial animals, of which government is the shepherd,” which will surely sooner or later come under the control of “any group of ruffians.” More tersely: Welfare Statism=Inevitable Long Term Moral Decline=Hilter! ! ! ! Hayek surely had his moments of brilliant insight, but this wasn’t one of them – for all his protestations of anti-conservatism it’s a fundamentally conservative, and rather idiotic claim. I don’t think that Judt was being unfair at all. Responding to Judt’s attack on Hayek as reinforced by Farrell, Kevin Vallier tried to shift the conversation toward an understanding of what Hayek actually thought about the welfare state, offering a conceptual distinction — of whose relevance I am somewhat skeptical — between a welfare state of law and a welfare state of administration, the former referring to a welfare state in which benefits are administered in a uniform fashion according to legally prescribed rules and a welfare state in which the benefits are distributed by officials at their own discretion. In reply, Farrell dismisses the point that Hayek was not opposed to the provision of a safety net and various forms of social insurance. Farrell regards this as an irrelevant detail. This is, in fact, agreed to by all parties – hence my suggestion in the original post that “Hayek clearly believes that there are non-statist, non-paternalist ways of achieving some (if not all) of the same ends.” But the reason why Hayek sees this as allowable, as Vallier acknowledges in his own defense of Hayek, is that it is not statist – it involves coercion, but does not have the statist logic that Hayek views as pernicious. Now if you find this a bit confusing, I can’t blame you, because it is. But the confusion is not all Farrell’s. It is also Hayek’s. He did try to get more mileage out of his argument in The Road to Serfdom than it could sustain, and to do so he had to resort to sociological intuition, hand-waving and rhetoric, in contrast to the comparatively rigorous argument of The Road to Serfdom. Nevertheless, the avowedly socialist postwar Labour government nationalized many industries, and tried to implement central planning, so Hayek’s concerns about the consequences of the Labour government must be considered in a wider context than just expansion of the welfare state. What was unfair about Tony Judt’s comment was a failure to distinguish between the different levels of the argument that Hayek was making. The arguments may have been related, but they were not the same. The argument of The Road to Serfdom was an argument about the logical implications of central planning. The argument about the welfare state was an argument about a slippery slope. Those are very different arguments, and not to acknowledge the difference is unfair, even (or, perhaps, especially) if Hayek’s argument about the welfare state was less than compelling. On Monday I wrote a post with the chart below showing the close correlation since January of this year between the S&P 500 and expected inflation as (approximately) reflected in the spread between the constant maturity 10-year Treasury note and the constant maturity 10-year TIPS. A number of other bloggers noticed the post and the chart. One of those was Matthew Yglesias who coupled my chart with a somewhat similar one posted by Marcus Nunes on his blog on the same day as mine. One commenter (“Fact Checker”) on Matthew’s blog criticized my chart accusing me of cherry picking. The second graph is meaningless, as it does not work through time. 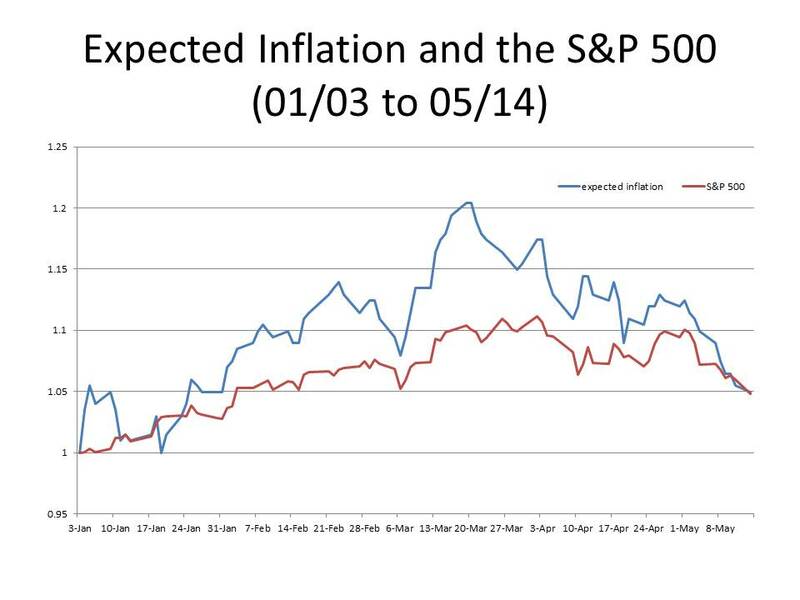 The S&P + inflation chart is reproduced below, with longer windows. And as you suggest there is no correlation in any time frame but the very short window cherry picked by MY. Two points to make about his comment. First, if Fact Checker had read Yglesias’s post carefully, or, better yet, actually read my post (let alone the original paper on which the post was based), he would have realized that my whole point is that the close correlation between expected inflation and stock prices is generally not observed, and that one would expect to observe the correlation only when deflation exceeds the real rate of interest (as it does now when slightly positive expected inflation exceeds the negative real real rate of interest). So the fact that the correlation doesn’t work through time was precisely the point of my post. Second, the graphs to which Fact Checker links use survey data by the University of Michigan of the inflation expectations of households. I do not totally discount such data, but I regard survey estimates of expected inflation as much less reliable than the implicit market expectations of inflation reflected in the TIPS spread. To show that the correlation I have found is reflected in the data since approximately the beginning of the downturn at the very end of 2007, but not before, here is a graph similar to the one I posted on Monday covering the entire period since 2003 for which I have data on the 10-year TIPS spread. 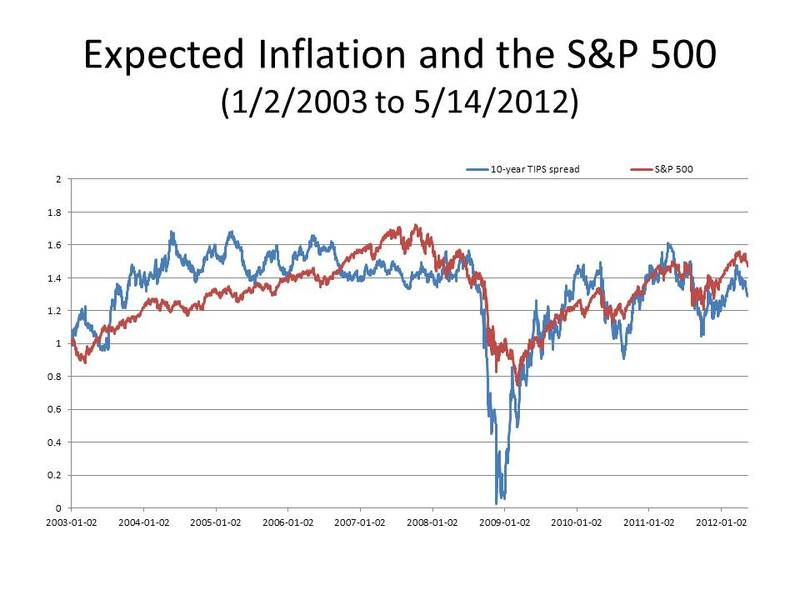 Before the beginning of 2008, there is plainly no correlation at all between inflation expectations and stock prices. It is only at some point early in 2008 that the correlation begins to be observed, and it has persisted ever since. We will know that we are out of this Little Depression when the correlation vanishes. The elevation of credibility into a central economic has turned a sensible point — that policy stability is good for both business and households — into a dogma that endangers economic stability. The credibility the models describe is impossible in a democracy. Worse, the attempt to achieve it threatens democracy. Pasok, the established party of the Greek left, lost votes to the moderate Democratic Left and more extreme Syriza party because it committed to seeing austerity measures through. Now the Democratic Left cannot commit to that package because it would lose to Syriza if it did. The UK’s Liberal Democrats, by making such a deal, have suffered electoral disaster. The more comprehensive the coalition supporting unpalatable policies, the more votes will go to extremists who reject them. We got into this mess in 2008, because the FOMC, focused almost exclusively on rising oil and food prices that were driving up the CPI in the spring and summer of 2008, ignored signs of a badly weakening economy, fearing that rises in the CPI would cause inflation expectations to become “unanchored.” The result was an effective tightening of monetary policy DURING a recession, which led to an unanchoring of inflation expectations all right, but in precisely the other direction! Now, the ECB, having similarly focused on CPI inflation in Europe for the last two years, is in the process of causing inflation expectations to become unanchored in precisely the other direction. Why is it that central bankers, like the Bourbons, seem to learn nothing and forget nothing? Don’t they see that central bank credibility cannot be achieved by mindlessly following a single rule? That sort of credibility is a will o the wisp. From a news release issued by the Federal Reserve Bank of Cleveland after the BLS reported that the CPI was unchanged in April. The Federal Reserve Bank of Cleveland reports that its latest estimate of 10-year expected inflation is 1.38 percent. In other words, the public currently expects the inflation rate to be less than 2 percent on average over the next decade. The Cleveland Fed’s estimate of inflation expectations is based on a model that combines information from a number of sources to address the shortcomings of other, commonly used measures, such as the “break-even” rate derived from Treasury inflation protected securities (TIPS) or survey-based estimates. The Cleveland Fed model can produce estimates for many time horizons, and it isolates not only inflation expectations, but several other interesting variables, such as the real interest rate and the inflation risk premium. The Cleveland Fed’s estimate of expected inflation was 1.47 percent, so expected inflation dropped by .09 basis point in April. It undoubtedly has continued falling in May. The lowest monthly estimate of expected inflation over a 10-year time horizon ever made by the Cleveland Fed was 1.34% in February of this year, so we may now already be stuck with the lowest inflation expectations ever. Is anyone at the FOMC paying attention? If I had a twitter account, I might have just tweeted this, but since I don’t, I will write a quick post instead. In the Economix blog at the New York Times website, Bruce Bartlett writes a post today with the somewhat misleading title “What Rule Should the Fed Follow?” about how Austrian Business Cycle Theory has come to dominate the thinking of right-wing economics, displacing the Monetarism of Milton Friedman. As some commenters point out, that is a bit of an exaggeration on Bartlett’s part. At the upper levels of right-wing economic policy-making, there are still very few, if any, Austrians to be found. However, mainstream types like John Taylor and Alan Meltzer have managed to make the necessary adjustments to the zeitgeist. All in all, a worthwhile and enlightening discussion, but I couldn’t help wondering . . . whatever happened to Hawtrey and Cassel? The S&P 500 fell today by more than 1 percent, continuing the downward trend began last month when the euro crisis, thought by some commentators to have been surmounted last November thanks to the consummate statesmanship of Mrs. Merkel, resurfaced once again, even more acute than in previous episodes. The S&P 500, having reached a post-crisis high of 1419.04 on April 2, a 10% increase since the end of 2011, closed today at 1338.35, almost 8% below its April 2nd peak. What accounts for the drop in the stock market since April 2? Well, as I have explained previously on this blog (here, here, here) and in my paper “The Fisher Effect under Deflationary Expectations,” when expected yield on holding cash is greater or even close to the expected yield on real capital, there is insufficient incentive for business to invest in real capital and for households to purchase consumer durables. Real interest rates have been consistently negative since early 2008, except in periods of acute financial distress (e.g., October 2008 to March 2009) when real interest rates, reflecting not the yield on capital, but a dearth of liquidity, were abnormally high. Thus, unless expected inflation is high enough to discourage hoarding, holding money becomes more attractive than investing in real capital. That is why ever since 2008, movements in stock prices have been positively correlated with expected inflation, a correlation neither implied by conventional models of stock-market valuation nor evident in the data under normal conditions. As the euro crisis has worsened, the dollar has been appreciating relative to the euro, dampening expectations for US inflation, which have anyway been receding after last year’s temporary supply-driven uptick, and after the ambiguous signals about monetary policy emanating from Chairman Bernanke and the FOMC. The correspondence between inflation expectations, as reflected in the breakeven spread between the 10-year fixed maturity Treasury note and 10-year fixed maturity TIPS, and the S&P 500 is strikingly evident in the chart below showing the relative movements in inflation expectations and the S&P 500 (both normalized to 1.0 at the start of 2012.